A new revised copy of the Ezekiel Diet Handbook is now available for download FREE. This blog is an ongoing journal about my research into how to lose weight and keep it off, or maintain a healthy weight. It’s over 40 years of weight loss experience. Maybe you can spare yourself some of the key points and secrets I missed in that 40 years that kept me from maintaining my ideal weight. I’m in my mid 50s and in March of 2010 I embarked on another of many weight loss programs to try and lose the extra weight I’d accumulated and once again, try to keep it off. I was easily 100 pounds overweight with sleep apnea, heel spurs, high blood pressure, rapid pulse, and knees that ached from all the extra weight. I lost a pound a day for 45 days and another 55 pounds in 105 days. A total of 100 pounds in 5 months. I went from 325 pounds with 62 inch shoulders and a 52.5 inch waist to 225 pounds with 50 inch shoulders and a 38 inch waist. I’ve never lost this much weight in my life. I didn’t even believe what I did was possible. I completely cured sleep apnea, was off blood pressure and pulse medications in only 8 weeks, my heel spurs went away and I currently have the same waist I had when I was a teen. My average blood pressure is about 115/70 with a pulse in the mid 70s range, however I regularly see it go as low as 100/55 with a pulse in the 60s. How did I do it? By eating only fresh food from the grocery store. Fresh meat, fruits and vegetables. Nothing out of a box, bag, can, jar, or bottle with very few exceptions like 1 in a 100 products in the grocery store. I completely eliminated refined sugar, high fructose corn syrup, corn syrup, bread, pastas, basically all refined carbohydrates, and I drastically limited sodium (salt) to less than 2,000 mg a day. Thinking of leaving. Does eliminating these foods sound impossible? Take a look at the pictures of the meals, snacks and desserts and condiments at: 128 EZ Meals on the Ezekiel Diet Files, and Sample Meals on the EZ Diet and the 34337 System, and in The FREE Ezekiel Diet Handbook PDF here: https://www.onlinefilefolder.com/3smRc5itlGwieg I used to achieve this weight loss. I’m no stranger to losing weight, I’ve been losing 30 to 50 pounds every 3 or 4 years since I was 10 years old. I know what it is to struggle hard to lose weight. I’ve bought into the lie that the only way to lose weight is to use a Biggest Loser boot camp style regimen of cardiovascular workouts. I want to expose numerous lies and ploys used by the weight loss industry, the media, fast food establishments and the restaurant industry in general, food manufacturers, and huge corporations who have a profit motive behind keeping you in the dark about the truth regarding weight loss and your health. Follow me on this journey and awaken to a world of deceit that seems to have your early demise as its endgame. Stow your tray tables, put your seat in the upright position and fasten your seat belts because we’re about to embark on a life changing journey. Come with me and we’ll crack the weight loss code and make it simple. I have no other motive than to help you do exactly what I did. It was the easiest weight loss I’ve ever experienced. I dubbed this system of eating The Ezekiel Diet because I discovered Ezekiel Bread in place of daily starch servings actually accelerates weight loss. The Ezekiel branding is appropriate for other reasons. We’re moving into extremely perilous times geopolitically, financially, and spiritually. A period of time I believe Ezekiel foretold about in the second half of his Biblical writings and I believe it is more important now than ever before to get healthy. Ezekiel means strengthened by God, not “bread cooked over dung”. I understand the bread recipe God gave to Ezekiel was part of a special ritual given to Ezekiel alone. The defiled bread (because of the cooking process) was symbolic of the coming defilement of the children of Israel in the land of the Gentiles. This is the bread that Ezekiel lived off of while he was in the desert for two years. This is the only incident where we see God hand a recipe to man. As far as I’m concerned the Creator is giving us the fuel formula for the human body He designed. There’s probably more to this bread recipe than we’ll ever know, in this world anyway. The Ezekiel bread of today is from sprouting the ingredients which creates a perfect protein that helps you reduce carbohydrate intake and accelerate weight loss. The Ezekiel bread you can buy today is manufactured in ovens rather than baked over “dung” as God prescribed in the defiling ritual to Ezekiel. It’s the ingredients that are so rich in nutrients and assist in the weight loss process that we’re after. You see to make money in the weight loss industry you have to have a proprietary system. A system that belongs to the originator that is unique from the other systems such as Weight Watchers, NutriSystem, Lean Cuisine, HerbaLife, or any of the myriad of different plans, pills, shakes, drinks, etc. on the market. I’ll be the first to tell you most of these programs all work to some degree. Some faster than others. However, there is one huge problem….the minute you stop buying the proprietary system and try to go-it-alone eating real food all the weight slowly creeps back on. These programs simply aren’t sustainable long term. This is a huge point I missed for 40 years. While you and I have been on the work-a-day-slave-tread-mill to keep our bills paid there has been a quiet paradigm shift in the way processed food is manufactured in this country. You see huge corporations have quietly hired armies of research and development scientists, chemists, marketing groups, tasters, controlled studies, etc. to cater to our insatiable appetite for sugar and extreme amounts of sodium (salt). However, they’ve gone a step further by adding MSG, a natural substances that acts like an excito-toxin drug on your brain and all major organs, to actually hook you on particular brands. See Russell Blaylock MD presentation about the effect of nutrition on brain function. This practice is rampant in the food supply. It’s also extremely unhealthy and causes numerous side-effects and illnesses. They know exactly how the average person will respond to this high sugar, high sodium, and MSG excito-toxin laiden food because they’ve conducted hundreds of controlled studies. Like a lab rat smacking a feeder lever for more cocaine until it dies. Here’s the problem…your health and ability to maintain normal body weight was not the end goal of processed food manufacturers, profit was their goal. The bottom line. These people simply do not have your best interest at heart. They have their own interest at heart, a profit motive. I’ve done a lot of research into how food processing actually started in the 1700s until today and here’s one very interesting point I want to make. In the early 1700s before food processing and canning in glass jars started the general consensus was: if the food wasn’t fresh it posed a danger to your health. When I read that it stuck in my mind for days. It finally occurred to me that in almost 300 years we’ve come full circle back to the same problem. Today we have the exact same situation, if your food isn’t fresh, it poses a danger to your health. Processed food has become a cesspool of sugar, high fructose corn syrup, corn syrup, genetically modified corn and soy products in 95% of the products in the grocery store, chemicals to enhance presentation, extreme amounts of sodium to extend shelf life, dangerous food colors, and even excito-toxin drugs designed to trick your brain into believing the food is the best thing you’ve ever eaten, etc to the point where the majority of the food sold in supermarkets is tainted and dangerous to your long term health. This is the problem folks. Plain and simple, in 300 years we’ve come full circle to, if it’s not fresh it poses a danger to your health. Bottom line you have to stop eating heavily processed food that comes in a box, can, bag, or frozen container with just a very few exceptions. So caveat, key point and secret #2 – If it’s not fresh it poses a danger to your health…if you want to lose weight and be healthy you have to stop buying processed food. What is the core food group breakdown for suggested meals on this “system” of eating during the weight loss phase? I will further define the meal breakdown and portion sizes but first…. Look at this closely. I’ve been told this is the original Weight Watchers System before they convoluted it into a proprietary point system. Why would they do this? Because the food breakdown above was too easy to pass from person to person. This meal breakdown is also the basis for most weight loss programs on the market today. The only difference is we’re going to buy all this stuff as fresh as possible locally and at the best price. During the weight loss phase this program, like your average American diet, will not provide all the needed Omega 3-6-9 Essential Fatty Acids (EFA). EFAs mainly come from deep cold water fatty fish, nuts (both limited or not allowed), borage oil, flaxseed, cod liver oil, etc. EFAs must be ingested because the body can’t make them. The cheapest way to get them is via softgel pills, normally two a day. Other options are oils and liquids you can get at the health food store in the refrigerated section. The oils can be added to food or salad dressings. Best if taken after a meal. Key Point & Secret – Weight Loss is dependant on Essential Fatty Acids. I recommend 2,000 mg of Omega 3 and at least 1,000 mg of Omega 6 and 1,000 mg of Omega 9. The average American is consuming up to 10,000 mg of sodium a day. Almost all processed food will have extreme amounts of sodium. Almost all fast food and anything made at a restaurant will be loaded with sodium. Excessive sodium will slow or stop weight loss even while eating healthy. I have come to believe the bloating process from excessive sodium is cumulative. You don’t simply bloat once and that’s it. You can add bloat on top of bloat, on top of bloat, on top of bloat. Most high blood pressure is directly related to excessive sodium in the diet. The minimum body requirement for sodium is at least 500 mg a day (caveats – nursing, lactating women, excessive sweating from exercise & manual labor, etc). This system limits sodium to what naturally occurs in meat, eggs, butter, plus the added sodium in condiments such as steak sauces and salad dressings. Try to limit sodium to less than 1,000 mg day and you’ll lose weight fast. Between 1,000 and 2,000 mg weight loss slows. Over 2,000 mg a day and weight loss stops. Way over 2,000 mg a day and you’ll start adding water weight (bloat). Note: Watch high sodium content in some brands of chicken, fish, steak, ground beef, etc. Many brands, especially in large Mart type stores, will add excessive sodium “marinade” to increase shelf life and add taste. Chicken should have 40 mg per 4 ounces naturally occurring. Anything over that is added. Many have 300 to 400 mgs per 4 oz., way too much. Frozen shrimp should be washed, rinsed, re-rinsed, and re-rinsed to lose as much sodium as possible. Any bagged frozen chicken, fish, hamburger patties will have excessive sodium. Salad dressings can have very excessive amounts of sodium. You’ll learn most vinaigrette and olive oil dressings will be your best bets. Many Italian dressings are loaded with sodium. Also stay away from salad dressings with sugar or high fructose corn syrup as a main ingredient. This simply gives you a rule of thumb for sodium content in recipes where you have control of quantity. Most processed food is loaded with excessive sodium. It’s when you are consuming several thousand milligrams a day unchecked you’ll experience very quick weight gain as well as high blood pressure. This can easily happen even while eating “healthy” processed food. You have to watch sodium from every source. On the Ezekiel Diet your condiments, sauces, and dressings will be the main source of extra sodium added to what naturally occurs in meat, eggs, cream, butter, fruits and vegetables. 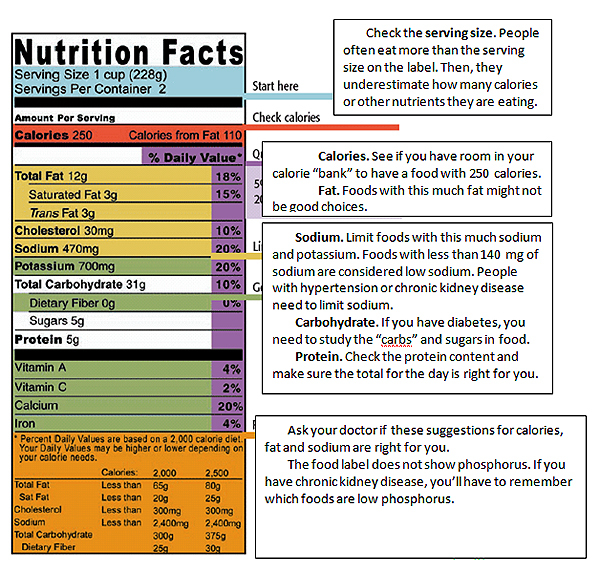 Key Point & Secret: Excessive sodium will sabotage even the healthiest eating plan. Limit sodium intake to less than 2,000 mg a day and you will lose weight. Limit sodium to 1,000 mg a day and you will lose weight fast. This image shows you how to read a food label. When I grab any processed food product off the shelf the first thing I look at is SODIUM. By the way, at 470 mg of sodium per serving I would put this product back on the shelf, and wouldn’t waste any more time. If it passes the sodium test, then I look at calories, then I’m scanning the ingredients list for sugar or high fructose corn syrup. Then MSG in a dozen different names. By this point 95% of new items I look at fail. Completely. You have to read food labels. Also be aware that there is an industry ploy to confuse the actual content of ingredients by breaking the contents into servings. Notice the serving size above. They seem to think a can of soup will make two servings so you have to double the sodium content on both products. You have to do this with everything you buy. Meat, dairy, salad dressings, sauces, mixes, bread, everything. Sodium is in extreme levels in almost all processed food. The exceptions are few and far between. Adequate water is absolutely essential to the weight loss process. This is especially true with this particular system of eating. You will be dumping excessive fluid filled with toxins from every fat cell in your body. You need to assist your liver and kidneys to filter this crap out of your blood and body by drinking 64 to 80 ounces of the cleanest water you can afford to filter yourself. Forget about most bottled water as it has been found to be more polluted than plain tap water. This is partially due to the chemicals that leach out of the plastic into the water. I recommend filtering your own tap water with the best filter you can afford. I even highly recommend filtering the fluoride out of your water. Try it. After a week or so of cooking and drinking fluoride free water your mind will start working like it’s on a ginseng buzz. Forget about all the hype and propaganda about fluoride being good for the teeth of children under 10 years old. That’s a complete lie. Hitler was the first to medicate water supplies with fluoride in the prisoner of war camps to keep the prisoners docile and compliant. Does anyone really believe Hitler was concerned about prisoner’s teeth? Do yourself a favor and get rid of the fluoride zombie shuffle. Do the research yourself, don’t take my word for it. Hundreds of years ago in Europe someone asked the question, “why does this whole group of people seem to be docile and not care what their government does, while this other group over here is militant and riots in the street every time their government gets out of line?” The answer was the docile zombie-like population had naturally fluoridated water. The alert non-zombie crowd were not drinking naturally fluoridated water. Key Point & Secret: Drink a minimum of 64 to 80 ounces of water a day of the cleanest water you can afford to filter yourself. Fail here and you will not lose a pound a day. Weight loss is dependant on adequate hydration. (NaturalNews) If something sounds too good to be true, the old saying goes, it probably is. But here’s an exception: scientists have documented that an all natural appetite-control agent with no side effects really does help people shed excess weight — and what’s more, it’s practically free. Scientists just reported the results of a new clinical trial of this weight loss-promoting liquid at the 240th National Meeting of the American Chemical Society (ACS) in Boston. So what’s in this “magic elixir”? Plain water. Dr. Davy, who was the senior author of the study, explained that folklore and anecdotal experiences have long suggested that drinking more water might promote weight loss. In addition, previous research has suggested that drinking water before meals reduces the intake of calories. But until now, there has never the scientific “gold standard” evidence from a randomized, controlled clinical trial comparing weight loss among dieters who drank water before meals to dieters who did not drink the extra water. The new study involved 48 adults between the ages of 55 and 75 years. They were divided into two groups and, although all research subjects ate a low-calorie diet for the study, one group drank 2 cups of water before meals and the other group did not. After 12 weeks, the water drinkers had lost about 15.5 pounds, while the non-water drinkers lost about 11 pounds. So why is drinking water before a meal an effective way to lose weight? Dr. Davy said it may simply fill up the stomach with something that has no calories. And when people feel full, they usually eat fewer calorie-containing food during their meal. In addition, Dr. Davy added, drinking water may also help people lose weight if they drink plain water instead of calorie-laden sweet beverages, such as sodas. As NaturalNews previously reported, researchers from the Columbia University Mailman School of Public Health and the Harvard School of Public Health analyzed what children and teens ate and drank over two different days and found that substituting water for sweetened drinks could help fight the teen obesity epidemic. Consuming water instead of sugary sodas, for example, could eliminate an average of 235 excess calories per day among children and teens (http://www.naturalnews.com/026032_h…). Grapefruit compound could treat diabetes, lower cholesterol and produce Atkin’s diet benefits without dieting. A compound found in grapefruit called naringenin actually triggers the liver to break down fat similar to the fasting process without dieting. Bottom line: there’s extremely sweet breaking news about a compound hidden in the tangy flavor of grapefruits that may treat diabetes naturally and also bring some of the benefits of low carb dieting to the body, too — without dieting. Scientists from the Hebrew University of Jerusalem and Massachusetts General Hospital (MGH), have discovered that naringenin, an antioxidant derived from the bitter flavor of grapefruits and other citrus fruits, triggers the liver to break down fat. While the function of the pancreas is important to diabetics, the liver is the main organ responsible for the regulation of carbohydrates and blood levels of fat. After a meal, the blood is flushed with sugars, which activate LXR-alpha, a PPAR associated with inflammation. This triggers the liver to create fatty acids for long-term storage. But during periods of fasting (and low carb dieting) the process is reversed, fat cells release fatty acids and break them down to ketones. There’s an increased sensitivity to insulin, too. The new research, just published in the online journal PLoS ONE, shows that naringenin activates two kinds of PPARs (dubbed PPAR-alpha and PPARy) and blocks LXR-alpha — resulting in fasting-type benefits to the body. “It is a fascinating find,” Yaakov Nahmias, PhD, the paper’s senior author said in the press statement. He pointed out that the results of the research were what the pharmaceutical industry has long been seeking through drug research. “But their (drug) development was plagued by safety concerns. Remarkably, naringenin is a dietary supplement with a clear safety record. Evidence suggests it might actually protect the liver from damage,” Dr. Nahmias added. If the results of the new study hold up in human patients, the research team believes the grapefruit compound could become a treatment for high cholesterol, type-2 diabetes, and metabolic syndrome. Key Point & Secret – A compound found in grapefruit will accelerate the weight loss process by creating fasting-type benefits to the body similar to the Atkin’s diet. Eat at least one or two grapefruits a day to accelerate the weight loss process. 5 Meals a Day: breakfast, mid-morning snack, lunch, mid-afternoon snack, and dinner. If needed after dinner, a 70 to 180 calorie nutrition bar, preferably non-gmo soy. South Beach and Atkins (not peanut filled, oats, cereal, etc) only soy, preferably non-gmo. Calories: Here’s the calorie rule of thumb: protein source at or below 250 calories, fruits in the 50 to 75 calorie range, vegetables in the 25 to 50 calorie range, starch in the 50 calorie range. For men Breakfast will average around 300 calories, Lunch and Dinner should be in the 400 calorie range, with 200 calories from snacks. For women Breakfast would be 200 to 250, Lunch and Dinner 400 calorie range, snacks 150 to 200. Foods eliminated during weight loss phase: pasta, beans, green peas, carrots, cheese, nuts, most dairy, bread, etc. Timing Issues: Last fruit at least 4 hours before bedtime, dinner at least 3 hours before bedtime, last snack (if needed) at least 1 hour before bedtime. Food Source: Everything fresh or fresh frozen. Nothing out of a box or can, except tuna once a week. Very few exceptions to this rule. It eliminates 99 out of 100 products. There are clean packaged (processed food) you just have to look for them. Refined Sugar: None, no sugar, high fructose corn syrup, white bread, pasta. Based on my own personal experience, if you replace the starch source with low sodium Ezekiel Bread you will accelerates the weight loss process. You have the flavor and texture of bread in the form of a perfect protein. Ezekiel bread is sometimes referred to as “Bible Bread” or “Manna” bread. It is a multi-grain, “flourless” bread believed to be nutritionally complete. The Food for Life website explains that Ezekiel bread was inspired by the Scripture verse Ezekiel 4:9 which says “Take also unto thee Wheat, and Barley, and beans, and lentils, and millet, and Spelt, and put them in one vessel, and make bread of it…”. According to the biblical story, Ezekiel survived off this bread, while he was in the desert for two years. Nutritionists claim that when these six grains and legumes sprout and are combined, they create a complete protein that closely resembles the protein found in milk and eggs. It is heralded by the Food for Life website as being “84.3% as efficient as the highest recognized source of protein, containing all 9 essential amino acids”. They state that 18 amino acids are in Ezekiel bread, which is touted to be “flourless” and balanced naturally from these vegetable sources. You can find Ezekiel Bread in larger better stocked grocery stores (or those with a whole foods section) or health food stores in the frozen food section coolers. My experience is the price is the same at Health Food Stores as it is ay the Grocery Store, $4.99 a loaf on sale occasionally for $3.99. You keep it frozen until used and then lightly toast. Don’t toast too much as it will kill too many nutrients. Another key point that I missed for most of my life, you can’t lose weight while eating at restaurants and fast food establishments. Even if you eat what they label as “healthy”, or eat light. It’s all highly processed crack food. Restaurants load their food with sodium, MSG excito-toxins, and sugar, with a good dose of HFCS in most all condiments. The bottom line, if you didn’t buy it and make it yourself it’s mystery food and will cause you to get fat. Don’t for a minute believe you can just go to burger joint for a healthy baked potato. Because anything they might have, like a baked potato, that could be healthy will most likely be nuked with a microwave into a nutrient void facsimile of a potato. Any condiments they give you for a baked potato will be laden with MSG and as much sodium as they can load into it to feed your salt addiction. If you’re sensitive to sodium you can add 2 lbs a day in water retention bloat. I have come to believe the water retention bloating process is cumulative. You don’t just bloat once and that’s it. You will add bloat, on top of bloat, on top of bloat, on top of bloat for 50 to 100 pounds of fluid retention. In order to eliminate all refined sugar, excessive sodium over 2,000 mg a day, High Fructose Corn Syrup, and MSG drugs you will reduce the products available in a grocery store to 1 in 50. You have to search out that 1 in 50 to lose weight. Believe me the restaurants out there, even the best ones, will not do that. Eating at the Sub Shop isn’t eating fresh. Cold cuts are absolutely polluted with sodium and MSG. Most even admit it. Plus you don’t need the glucose spike from all that bread. And cheese, don’t get me started on that crap-food. Key Point & Secret: Leave the fast food establishments for inflamed, bloated, nutrient deficient, future cancer patients, crack-head drug addicts that are too stupid to know better. Fast-food-tards, bless their hearts. Remember this..weight loss is 97% diet and 3% exercise. Forget about expensive health club memberships you stop using just weeks into the new year. Forget about all the lies perpetrated by the mainstream media, medical and pharmaceutical industry, trainers, gyms and health clubs, and propaganda spectacles like The Biggest Loser. Your body will reset itself naturally back to your ideal weight when you stop feeding it polluted, nutrient void, over-processed food and give it proper nutrition from fresh food and the system outlined in this thread. Remember the large corporate food industry competes for your business by using excessive amounts of sugar, extreme amounts of sodium, HFCS, and MSG excito-toxin drugs. All designed to appeal to what you “want”, not what your body “needs”, like a drug dealer who wants to get you hooked on their brand. They do not have your best interest at heart. They have a profit motive. Don’t sacrifice your health and life on the alter of the food industries bottom line. The idea that you have to sweat the weight off in extreme boot camp style is just absurd and is perpetuated by way too many sources. The reason The Biggest Loser has to perpetuate this lie is because of all the processed food advertisers that network caters to. You can’t have a hit show stabbing their advertisers in the back with the truth. It had to be a conscious decision to focus the problem on extreme torturous workouts rather than the food itself. Someone made that call. The average person goes through life thinking everybody that looks professional and smiles a lot has their best interest at heart, never calling anything into question, just blindly following all the corporate, medical, and government Pied Pipers to their destruction. What’s even stranger than that is if you become vocal about that issue everyone just smirks and treats you like you’re an extreme nut-job for believing the FDA, big Pharma, and the gov may not have our best interest at heart. The fact is the food and water supply have been poisoned and pharmaceuticals kill tens of thousands every year. (NaturalNews) Women who rely on exercise to lose weight are destined to fail, so says a study that appears in the Journal of American Medical Association. Researchers found that exercise alone was useful in maintaining the weight for women, but it had no effect on heavier women. The study analysed almost 35,000 women over a period of 15 years. The scientists found that for women whose BMI was less than 25 kg/m2, there was a clear dose-response correlation between activity levels and weight gain. It took one hour’s moderate-intensity exercise each day to avoid the gaining of weight. Exercise did not, however, reduce weight and did not even maintain weight among women with a BMI from 25 to 29.9 kg/m2 or in those with a BMI of 30.0 kg/m2 or more. This was true regardless of how much exercise the participants did, with both exercise and nutritional interventions required to successfully reduce weight. The findings, while far from providing an answer to Western society’s battle of the bulge, act as confirmation of what many observers have known for a long time: more sweat on the treadmill does not necessarily equate a smaller waistline. Conclusions that exercise has little effect on weight loss are also premature, as the study did not make any distinction between aerobic exercise, which can inhibit weight loss through increased cortisol release, and resistance training, a preferred option for many personal trainers in improving body composition. More than anything, the study backs the importance of a nutritional program in any efforts relating to bodyweight management. Women who wish to lose weight should work smart by addressing their nutritional needs before adding exercise related to their goal. Working smart, it appears, is highly preferable to working hard.